From a remote controlled dragonfly to their award-winning Robosapien, toy maker WowWee is the master of all things robotic, but the inspiration for their toy creations often come from the world of video games. "All of us are gamers, we all play video games all of the time," said Davin Sufer, chief technology officer of WowWee. "It's definitely a big part of our culture." WowWee was formed in 1982 by brothers Richard and Peter Yanofsky, but it wasn't until 2004 that the company become known for their robot toys. With more than 5 million units sold worldwide, Robosapian, released in 2004, was the first commercially-available biomorphic robot. In 2005, WowWee released their second version of the remote-controlled robot. In 2006, WowWee added a robotic reptile to their toys. 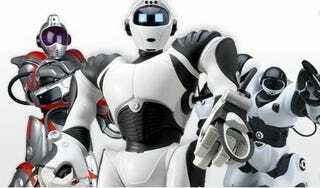 The company currently has a full line of robots, robocreatures and bugbots. Many of those creations, Sufer said, were conceived while playing games. "All of our favorite video games have something in them that sparks an idea," he said. The flying drones found in a lot of video games led WowWee to develop a line of flying toys, including the Bladestar. The helicopter-like Bladestar is an indoor flying machine that can dogfight by blasting infrared signals out of the remote. If the signal hits the toy it drops to the ground. "We like that sort of gameplay," Sufer said. WowWee is working on other toys that may make use of similar ideas, like shooting at one another. One, which Sufer couldn't go into much detail about yet, would be a ground toy that could fire off shots. "We have some products inspired by fast-moving vehicles (that we are working on)," he said. "Grand Theft Auto-style, fast moving vehicles that will interact with each other." The controls for WowWee robots also look toward gaming for inspiration. When initially released, the remotes used to control most of their robot toys looked like something you would use to turn on a TV or VCR. But more recent iterations include remotes that look more like video game controllers. "We've definitely looked at video games for that," Sufer said. "We took some cues from video games to figure out how you would control a robot with multiple limbs." WowWee's Tribot even uses tilt controls, allowing you to move the robot around as if you were playing a Wii game. There's also an iPhone app that allows you to control one of their robots. "We're always looking at the latest technology," Sufer said. "Like controlling a robot by moving your hands, a lot of gesture based controls are happening right now." But the company's biggest gaming effort hasn't yet come to fruition. WowWee hoped to introduce a robot that used augmented reality to turn everyday spaces into a video game like world, but they backed away from the notion because they thought it might be too complex for the average consumer to understand and enjoy. Rovio is a robotic wifi-enabled webcam. The dog-like device rolls around on three wheels and has a head-mounted camera and microphone. The device is controlled via a web browser. "Initially the idea behind that product was more for gaming applications," Sufer said. "You play a game through a robot, by driving it around." The idea was that you would place markers in a room in your house and then drive the robot around, controlling and watching it through a web browser, he said. When the robot saw and recognized those markers the software would replace the markers with gaming icons. "We're still working on that angle," he said. "We thought it was a little too much for the market. People had to get used to robots first and then tack on gaming." WowWee hasn't dropped the idea though, they hope to either release the software to support augmented reality with Rovio or perhaps release a new version of the three-wheeled bot with the game built into it. "I think something like Rovio could be used as a gaming platform," Sufer said. "We are looking at it as a platform." "I think that video games are getting more and more immersive and more and more interesting," Sufer said. "But there is always room for physical games and video games sometimes drive that need for real life objects."